My first day in Tokyo, we went to Shibuya and walked to Harajuku. After the UT t-shirt shop I saw this Kona Ute next to this one shop/boutique. 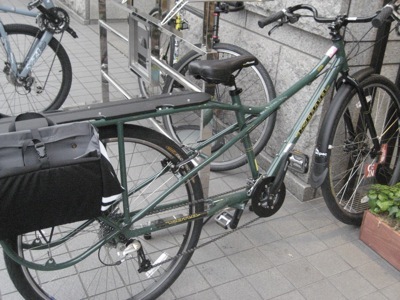 This is the only longtail I’ve seen in Japan, but though Japan may score low on the cargo bike parameter, this country is near tops for commuters. I’ve never been to Amsterdam, but in Copenhagen I saw a crapload of commuters. I think that if the subway/rail system wasn’t the best in the world then there would be even more cyclists commuting. There are definitely less motorscooters here than Taipei too.